The Dogma of Hell - The eminent French theologian, Fr. F. X. Schouppe, S.J., author of Purgatory Explained by the Lives and Legends of the Saints, has written here a similar-type book, though much smaller, on the subject of Hell. 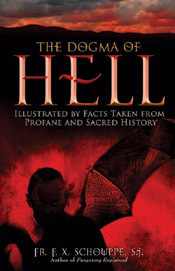 Whereas he does review the basic Catholic doctrine on Hell, in this book he mainly recounts numerous true stories that reinforce belief in Hell and the eternity of its horrors. These stories are frightening -- how could they be otherwise -- and they are obviously intended to be by the writer. For his purpose is to awaken in his readers a profound realization of the reality of Hell and to create in them a firm purpose of mind and heart not to go there. To the many who are not motivated to be good by the love of God, the fear of Hell is a legitimate and usually efficacious and salutary motive -- especially so when one considers Hell as exemplified in these true stories. 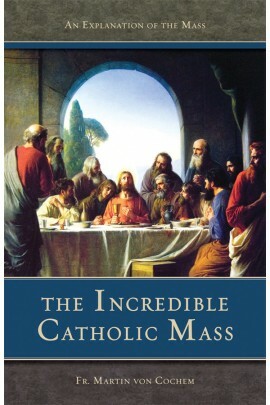 The Incredible Catholic Mass -- I believe that were it not for holy Mass, at this moment the world would be in the abyss, unable to bear up under the mighty load of its iniquities. Mass is the potent prop that holds the world upon its base. Therefore, when we are assisting at Mass, we ought to practice that which once Alphonsus of Albuquerque did, who, finding himself with his fleet in danger of perishing during a fierce and terrific tempest, adopted the following means: He took in his arms an innocent little child which was on board his ship, and lifting it up toward heaven, he said, "If we are sinners, this creature is certainly free from sin; O Lord, for love of this innocent, remit to us the death we deserve!" Will you believe it? The spectacle of that stainless babe was so pleasing to God that He tranquilized the sea, and changed into joy for these unfortunates their terror of a death already imminent. Now, what do you believe is done by the Eternal Father when the priest, lifting in the air the thrice-sacred Victim, shows to Him the innocence of His Divine Son? Ah, then His compassion cannot resist the sight of the most spotless innocence of Jesus, and He feels as if compelled to calm our storms, and to provide for all our necessities. The Hidden Treasure: Holy Mass -- I believe that were it not for holy Mass, at this moment the world would be in the abyss, unable to bear up under the mighty load of its iniquities. Mass is the potent prop that holds the world upon its base. Therefore, when we are assisting at Mass, we ought to practice that which once Alphonsus of Albuquerque did, who, finding himself with his fleet in danger of perishing during a fierce and terrific tempest, adopted the following means: He took in his arms an innocent little child which was on board his ship, and lifting it up toward heaven, he said, "If we are sinners, this creature is certainly free from sin; O Lord, for love of this innocent, remit to us the death we deserve!" Will you believe it? The spectacle of that stainless babe was so pleasing to God that He tranquilized the sea, and changed into joy for these unfortunates their terror of a death already imminent. Now, what do you believe is done by the Eternal Father when the priest, lifting in the air the thrice-sacred Victim, shows to Him the innocence of His Divine Son? Ah, then His compassion cannot resist the sight of the most spotless innocence of Jesus, and He feels as if compelled to calm our storms, and to provide for all our necessities. The Incorruptibles - The remarkable phenomenon of the incorruption of certain saints' bodies is the subject of this enthralling and well-documented study. The author, Joan Carroll Cruz, spent five years researching the lives of over 100 saints and beati in preparation for this book. One of the least known and most easily disbelieved religious facts is treated here in a scholarly and competent manner. As a result of this work many will finally understand that bodily incorruption is in fact a reality in the world of religion. 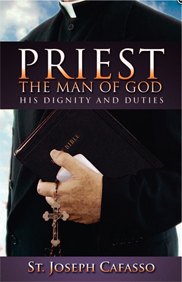 Priest: The Man of God iIf every priest in the Church knew this book and practiced what it says, we would have a different Church. Says the priesthood admits of no mediocrity; that a priest will either be a true priest and do immense good, or he will be an instrument of great evil. Gives firm, practical instructions to priests for both their personal life and their ministry-delicacy of conscience, hearing confessions, good example, etc. By one of the greatest priests who ever lived. Blessed Margaret of Castello (1287-1320) was born a hunchback, midget, blind, lame and ugly. When she was 6, her proud, noble parents walled her up beside a chapel. She could not get out, but could attend Mass and receive the sacraments. After 14 years of imprisonment, her parents took her to a shrine to pray for a cure. When no cure was forthcoming, they abandoned her. She became a lay Dominican and spent the rest of her life in prayer and works of mercy. When she died at age 33, the townspeople thronged to her funeral and demanded that "the saint" be buried in a tomb inside the church. The priest protested, but when a crippled girl was miraculously cured at the funeral, the people had their way. Blessed Margaret's story is one of the most moving we have ever read. Her body is still incorrupt. To order The Life of Blessed Margaret of Castello using PayPal click on the icon below. To order The Life of St. Gemma Galgani using PayPal click on the icon below. To order using PayPal click on the icon below. Here are over 20 true stories of women who had been guilty of adultery, murder, fornication and abortion, plus engaged in hatred, envy, lying and other sins -- yet found forgiveness, mercy, healing and peach through Our Lord Jesus Christ. 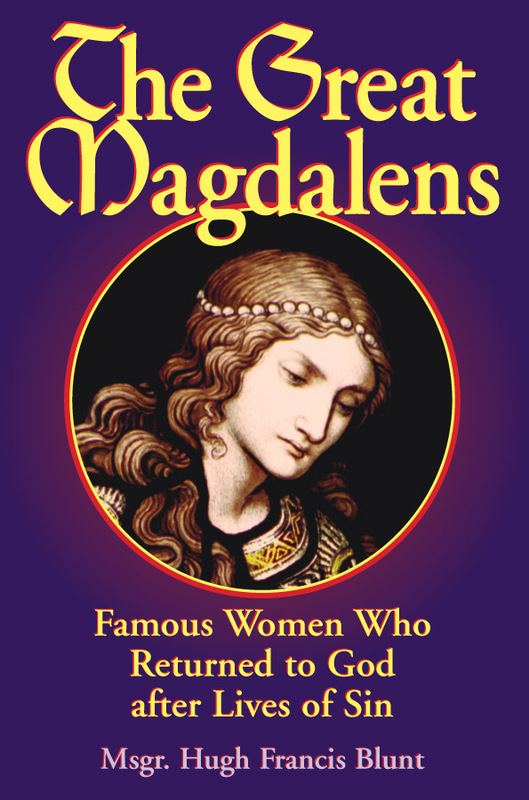 Starting with the great St. Mary Magdalen, out of whom Our Lord had cast seven devils, the stories continue, often giving a whole new picture of some of the most famous and infamous women in secular and Church History. These women were as passionate in atonment as they had formerly been in sin. Some had been rejected by their partners in sin; others had to make a supreme effort to tear themselves away. Some had children. Some were punished by civil law. some had to turn their backs on riches. Some had to disentangle themseslves from pollitical relationships. But all received the mercy and healing of Jesus Christ through the Catholic Church.